Reset: automatically reset the LFO to the value specified by the phase control works in Freq or Sync mode! Time is always specified in bars/beats. This makes it a lot easier to work with the LFOs frequency, since you can know that no matter how much it changes, it will always reset at the specified interval. Morph lock: only change the morph value at the beginning of the waves cycle. Takeover mode: temporarily bypass the LFO and control the value directly. The output crossfades between the LFO and the value over the time specified by the Fade control. Qnt: Quantize the output in 16th note units. 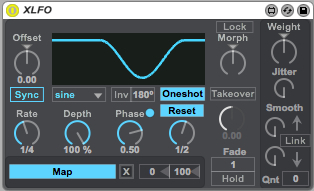 (0=off, 0.5=32nd) Get all those great sample-and-hold arpeggiator-like effects. Phases range is scaled by the PhaseMultiplier control, so you can set its range from 10º to 720º. Uses downsampling to produce similar CPU usage as the original, but with added features.